Battlestar Galactica, Microgaming’s sci-fi slot, comes with 243 ways to win, a top fixed jackpot of 3,000 coins, and plenty of lucrative features. Battlestar Galactica has 243 permanently activated paylines. To start playing, players need to bet anywhere in the range of $0.30 to $15.00 and spin the reels. If a winning combination of icons is displayed on the reels at the end of a spin, players can collect their payouts. If not, they can place another bet and try again. The slot comes with an Autoplay feature, which players can use to spin the reels automatically while they get busy with something else. 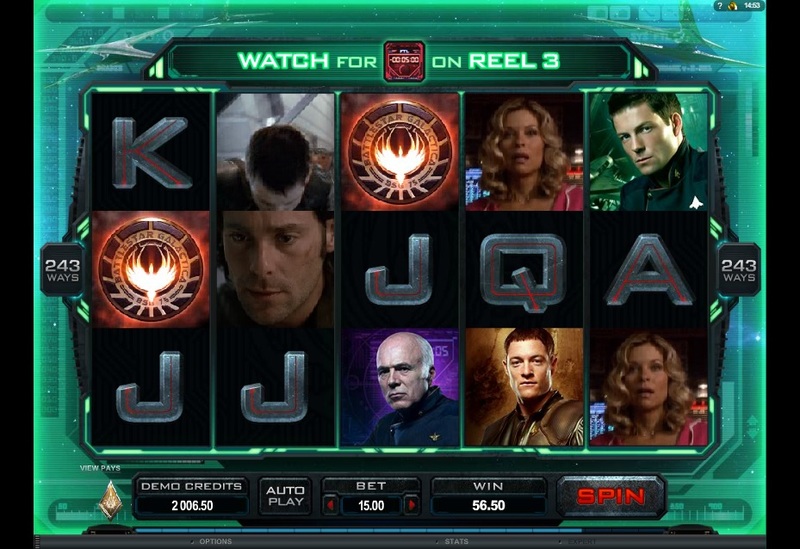 Inspired by Battlestar Galactica, a widely acclaimed sci-fi drama, Battlestar Galactica Slot was developed by Microgaming as the result of a licensing pact signed with NBC Universal Television Consumer Products. The slot gives players an audio-visual treat as it is packed with rich graphics, spectacular animations, and awesome animations. In addition to a few high-value card icons, Battlestar Galactica features icons of Six, Colonel Tigh, Helo, Ellen, Tyrol, Starbuck, Baltar, and Apollo. Battlestar Galactica can be played in two modes—the Run Mode and the Fight Mode. There is also a Ranking Achievements Feature, which encourages players to keep spinning the reels of this slot to achieve the rank of Admiral, win bigger prizes, and view exclusive video content from the Battlestar Galactica series. The Battlestar Galactica Logo serves as the wild symbol, but it can appear in stacks of three, increasing players’ chances of winning. This symbol cannot substitute for the scatter Viper Mark II symbol. In the game’s Fight Mode, random symbols get transformed into wilds, which can split into two to help players create more winning combinations. If players spin 3, 4, or 5 Viper Mark II scatter symbols anywhere on the reels, they can win 750, 1,500, and 7,500 coins, respectively. If players get at least three Viper Mark II symbols anywhere on the reels, the free spins round gets activated and players will receive 15 free spins with tripled wins. The free spins round can be activated in the Fight Mode too, but in this case, players will receive 5 free spins. But players can win more free spins by destroying the enemy fighter planes that fly across the gaming screen. The game also has a randomly activated Ion Storm Wild Feature, which can convert up to five reels into wilds. However, players cannot activate the free spins round during this feature. Battlestar Galactica is an action-packed, exciting slot that gives players the chance to win up to 7,500 coins in scatter wins, along with a top fixed jackpot of 3,000 coins. The presence of a Skill Stop Feature transforms this sci-fi slot into a game of skill.